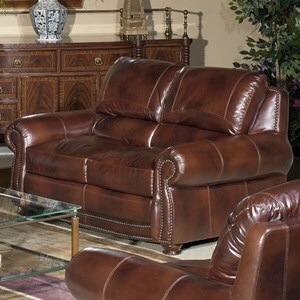 The perfect complement to your full-length sofa, this loveseat will complete the look and feel of any living room. 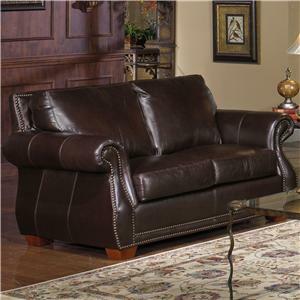 With quality comfort and elegant style all-in-one, you can't go wrong with this functional and fashionable addition to your home. 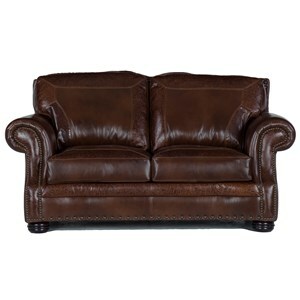 Traditionally detailed with rolled arms and nailhead trim, this loveseat is sure to bring grace and prestige to any room. But framed by crisp lines and block wood feet, this item is touched by a contemporary style that creates a more relaxed and versatile appeal. 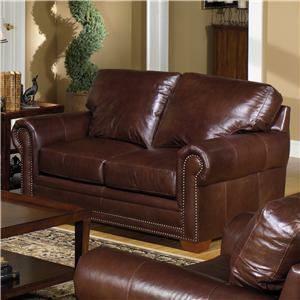 Great for snuggling up with a loved one, this loveseat is the perfect spot for enjoying a relaxing date-night in. 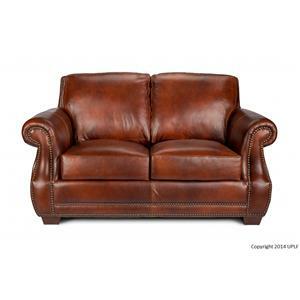 The 7855 Traditional Leather Stationary Loveseat with Nailhead Trim by USA Premium Leather at Howell Furniture in the Beaumont, Port Arthur, Lake Charles, Texas, Louisiana area. Product availability may vary. Contact us for the most current availability on this product. Fabric Options Available in Rio Aspen color. Tailoring Craftsmen meticulously hand-tailor each piece with careful attention to detail. Frame Construction The supreme quality of these pieces begins with completely solid 1-1/4” corner-blocked hardwood frames, which are double-doweled and reinforced, creating maximum strength. 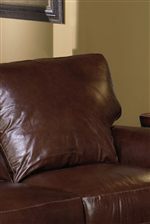 Dress up any room with the 7855 collection of upholstery furniture. Featuring a stationary sofa, loveseat, chair (not shown), and ottoman (not shown), this collection has something the whole family will enjoy. 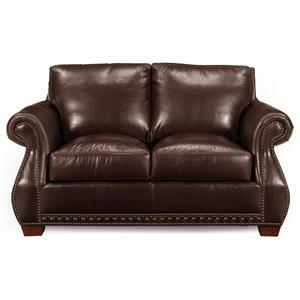 Carefully crafted to meet all your style and quality needs, each piece in this collection features genuine leather upholstery accented by elegant nailhead trim. 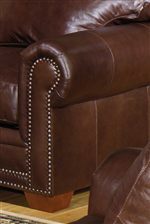 Along with rolled arms and block wood feet, the 7855 collection is the perfect blend of traditional and contemporary styles, creating a versatile setting that everyone will enjoy. 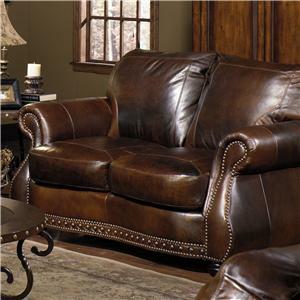 The 7855 collection is a great option if you are looking for Traditional furniture in the Beaumont, Port Arthur, Lake Charles, Texas, Louisiana area. 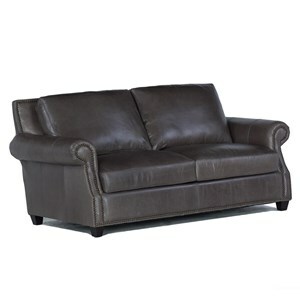 Browse other items in the 7855 collection from Howell Furniture in the Beaumont, Port Arthur, Lake Charles, Texas, Louisiana area.